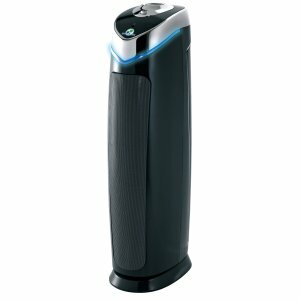 If you’re looking for one of the best-selling HEPA filter air purifiers on the market for small to medium sized rooms – then look no further than the GermGuardian AC4825 by Guardian Technologies. This model is not just a standard HEPA filter air purifier, no sir. It has three kinds of filtration all rolled into this one handy unit. Firstly, the air passes through a carbon pre-filter which catches large airborne particles and neutralizes odors. Secondly, it goes through the HEPA filter which captures the remaining mold spores, pollens, pet dander and any other particles larger than 0.3 microns (to put that in perspective, only 0.03% of airborne particles are small enough to pass through a HEPA filter!). Finally, the air receives some ultraviolet therapy. This is what kills the harmful airborne bacteria and viruses such as E-coli, streptococcus and rhinovirus. The UV function can be switched on and off as you require it. This three-pronged attack from the GermGuardian makes it a truly versatile air purifier for the home. Now this particular model is one of their smaller units, and it can circulate the air in a room of roughly 150 sq. ft. every hour. So, down to the important details. You’re probably thinking that a HEPA filter air purifier will cost you an arm and a leg. In fact, this model is very affordable given all the bells and whistles it has. It will only set you back $99.99 $83.62! Yep, for just one hundred bucks, this is a bargain. After three months of the best sleep you have ever had, you’ll be thinking that $1 per night was the best investment you’ve ever made :). But of course the party doesn’t stop there! You’ll get at least another three months out of your HEPA filter before you need to replace it (if you run it 24/7) and that will only cost you another $26. All in all, a pretty affordable HEPA filter air purifier.